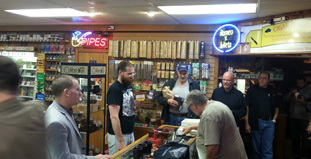 Cigar Brands - 82nd Ave Tobacco & Pipes LTD.
82nd Ave. Tobacco & Pipe carries a broad and diverse selection of cigars, over 900 styles, to suit any palate or pocketbook. With a dynamic inventory, we keep abreast with the latest industry offerings. 82nd Ave. specializes in small batch, limited release cigars, and as a certified Opus X dealer, we carry some of the world’s most rare and coveted cigars.